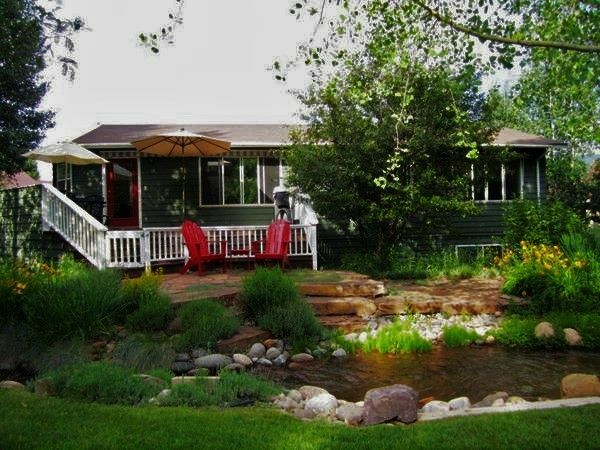 An easy 10 minute drive north of historic Durango in a quiet community, this charming creekside home offers mountain views backing up to the San Juan National Forest. This tranquil escape in the heart of the Animas River Valley features a bright and open great room with vaulted ceilings, comfortable seating, and an expanse of windows looking out to the spectacular backyard. This home is situated perfectly to enjoy all that Durango has to offer, with the many outdoor activities of southwestern Colorado at your doorstep. The great room features seating for parties of all sizes, satellite TV and DVD player, and a Wii. The dining area seats 8-10, with a view of the beautiful garden. The fully stocked kitchen has all the equipment you could think of. Located off the great room is the private home office with desk in case you need to work during your getaway. Games, puzzles, books, and children's toys are also available to keep the little ones busy. The private master suite has a luxurious king bed, large bath with double vanity, and a flatscreen TV and DVD player. Two additional bedrooms include a quiet room with a queen bed and a cheerful children's room featuring a bunkbed and cozy twin. Outside there is patio seating for 8, including a comfortable dining area and Adirondack chairs to relax in and enjoy the view. Follow the garden footpaths and wooden bridges over the small waterways that lead to the San Juan National Forest. Or relax, grill, and dine on the large back deck- a wonderful spot to enjoy the seasonal flower garden, frequent wildlife sightings, and breathtaking mountain scenery. Located right next door to our sister property the Creekside Bungalow. Please contact us for more information on renting these properties together. The AC amenity listed below is a swamp cooler for the upper floor. If you scroll further down you will see where that is clarified. This is a beautiful home, and we enjoyed our stay very much. It was just the right distance outside Durango. I’m not sure the description mentioned the bedrooms were all downstairs & that would have been nice to know. Our grandkids loved the outside. From the pictures we thought the location was away from most things, but this is really one short street with multiple houses. The upstairs gave us lots of space to visit and windows were abundant. The dining room table was spacious & sturdy. Kitchen was extremely well stocked as advertised. Thanks for sharing this beautiful garden spot. LOCATION WAS BEAUTIFUL & HOUSE WAS GREAT! The house was very nice and the setting was beautiful, despite the recent wildfires & mudslides. Our extended 8 adult family gathered at the house. We found the house very clean and ready for our arrival. The rental company representative came over to greet us and explain the lack of water in the back creeks due to the recent wildfires and mudslides. The beds were comfortable, the kitchen well equipped and the backyard and deck were a haven for relaxation! There were ample beddings but a few more towels (especially hand towels) was a recommendation we left behind. We had thought the house had air conditioning (probably our misunderstanding). The downstairs stayed plenty cool with ceiling fans, but the upstairs did get a little too warm for indoor cooking and for the one adult we had sleeping upstairs on the pull-out couch. There was a swamp cooler in a window upstairs but it wasn't the same as AC. We cooked on the grill several nights and that worked out great. We had 6 adults, but not all couples that were sleeping together so the children's bedroom with 3 beds only housed one of our adults. Hence, the other adult upstairs on the pull out couch system. We highly recommend this house to those looking for a tranquil place to relax and enjoy nature. It is well equipped with children's games and toys and adult books too. The property manager's were wonderful and went out of their way to accommodate us, especially with the unique weather issues and a short power outage we experienced. Loved our stay! The backyard was amazing and the house was comfortable and had everything we needed! Wonderful Home! Close to town and skiing! Home is spacious, clean, and well stocked. Perfect for our family and pups! We loved being close to town and ski area. Only reason we didn’t give it 5 stars was due to the quality of the mattresses other than that no complaints.